REDWOOD CITY, CA--(Marketwire - October 26, 2009) - The Gorilla Foundation, home of Koko, the gorilla who can speak to us through the use of American Sign Language (ASL), today announced the winner, selected by Koko herself, of their pumpkin design contest. Pumpkin-loving Koko closely inspected the carved and lighted creation, gently blew into its ear (of all the entries, only the top design she selected sported ears), then dug in and promptly devoured her own smaller carved pumpkin. Halloween is one of Koko's favorite holidays and every year she eagerly anticipates pumpkin season when her caregivers serve her the orange beauties as well as the roasted seeds. The Gorilla Foundation decided to share Koko's holiday with the community and invited local school, Kings Mountain Elementary, to submit drawings for a pumpkin design contest. The children, grades K-5, drew pumpkin faces. Koko reviewed the designs and selected her top three favorites in rank order. The winner received a photo of Koko posing with the carved pumpkin and a Koko plush doll; the two runners up each received the book "Koko-Love: Conversations with a Gorilla." Kyle Niermann, of Ms. Bolton's third grade class took first prize. The contest not only delighted Koko, but also helped raise awareness about the Gorilla Foundation's mission of conservation through communication to help protect endangered gorillas. To view additional photos of Koko's Halloween celebration, please visit: http://www.koko.org/world/halloween. To request access to high-resolution photos, please contact: joanna@kulesafaul.com. The Gorilla Foundation is dedicated to the preservation, protection and well being of gorillas through interspecies communication research and education -- Conservation through Communication. The Foundation was established in 1976 and is best known for its groundbreaking work with two western lowland gorillas, Koko and Michael, who became adept at using American Sign Language. The results are published in numerous research papers, books and videos available in our bibliography. The Gorilla Foundation is a non-profit 501c3 corporation and is underwritten by donations from individuals, grants from foundations and corporations, and educational product sales. The Foundation receives no support from government sources. Donate here. 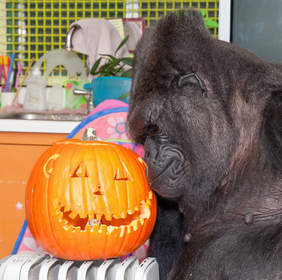 Koko cuddles with winning carved pumpkin.